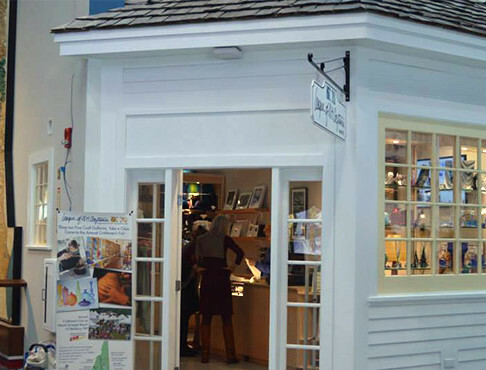 The League of NH Craftsmen’s Hooksett Fine Craft Gallery, the smallest and newest of the League’s eight fine craft galleries, is located in the I-93 Northbound Welcome Center in Hooksett, accessible from I-93N or from Route 3A (530 West River Road). This gallery offers visitors high quality, creative, and functional fine craft made by the League’s juried members, and provides information about the League’s events, activities, and other seven affiliated craft galleries located throughout the state. Visitors to the gallery will find a wide range of distinctive handcrafted gift items ranging from mugs, jewelry, glass tumblers, scarves, mittens, hand-turned wood bowls, garden sculpture, wine glasses, prints and more. Many of these items are suitable for travelers looking for hostess, wedding, graduation, birthday gifts, or gifts for themselves. 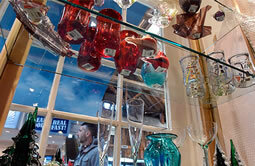 The gallery also features live fine craft demonstrations by juried League members throughout the year. Our on-line store is not ready yet. For more information about the Hooksett Gallery visit our website or stop in and visit us in the beautiful Welcome Center!